Japanese love to puzzle about how to make simple things elegant. Everyone knows about Origami, but there is also wrapping cloth or Furoshiki, which can be described as the textile version of Origami. I have been exploring creative ways of using these square pieces of fabric over the past few weeks. This beautiful furoshiki was hand-dyed onto linen by Saratetsu in Tokyo using a stencil with a vintage butterfly motif. I have previously blogged and posted on Youtube about the story of furoshiki stencil-dyeing, but I want to explain in this blog about its history, tradition, and uses. A butterfly furoshiki bag hanging on a peach tree. Wrapping cloth known as Tsutsumi have been mentioned in writings from as far back as the 8th Century AD. One reference is to a cloth wrapped around an imperial costume stored in the Todaiji Shosoin Imperial Repository in Nara. So the practice of wrapping things for storage has been taking place in Japan for more than 1300 years. And it was not that long ago that these simple but versatile cloths were part of everyday Japanese life. They were used to carry or store away practically anything. Even children wrapped their books in furoshiki to go to school. Using furoshiki for carrying personal items fell out of fashion in post-World War II Japan when owning a Western-style bag became fashionable. At around the same time, Japanese department stores started giving paper bags to customers to carry their purchases. I remember when I was a young girl enjoying the status symbol feeling of carrying a paper bag from a major department store such as Isetan. Despite the waxing and waning of fashion fads, if furoshiki did not efficiently serve its purpose, how could it have survived for more than a millennium? As I explored and experimented in different ways to using a furoshiki, I discovered many advantages of using this benign piece of square cloth. Three same size furoshiki. They only become as big as the items you are carrying. First, they are flexible. They only become as big as what you carry in it. Secondly, they are easy to clean. If you’re coming home from the beach carrying a sandy towel, all you have to do is to dust it off. Moreover, if you are giving away or returning the content, you can fold it away after use. This is especially useful when you are taking a bottle of wine to a dinner or returning a library book. This adaptable and continuous use of furoshiki makes them economical and environmentally friendly. The Japanese Ministry of the Environment has a wonderful site where they have diagrams of different ways of using a furoshiki. For all you book worms, the hon-tsutsumi, or the ‘two books carry wrap’ is especially intriguing and my favorite. Next time you go on a picnic, maybe you’ll be inspired to take your lunch or favorite books in a furoshiki. Now that would be a fashion statement for the ages. Saratetsu, the last yuzen wrapping cloth (or furoshiki) dyer in central Tokyo, has accumulated a treasure trove of stencils since opening for business in 1910. KotoKoto was especially fascinated by the design of old paper stencils that Saratetsu used before switching to computer generated screens 22 years ago. These old paper stencils are called katagami, and are made by layering multiple pieces of Japanese paper glued together with persimmon tannin. Kimono and other fabric dyed with these waterproof paper stencils were extremely popular in Japan from the mid Edo (around 1800) to the early 20th century. We wanted to pick two stencil patterns to be used for our new linen designs. But with such rich choices available, making a decision was incredibly difficult. Many were not just beautiful but had special meaning to the Japanese people. For example, the ‘feather of arrow’ pattern had the power to ward off evil. It also was often used on gifts to a bride to wish her a happy marriage. As an arrow never came back once it was shot, the gift senders wanted to wish that the bride would not return home because of a broken marriage. After taking many pictures of the old stencils, countless hours were spent back in California contemplating all these attractive patterns and the meanings they convey. We are finally happy to announce the selection of the butterflies and fern patterns! According to the book “Symbols of Japan – Thematic Motifs in Art and Design” by Merrily Baird, the butterfly is a symbol of joy and longevity. It is also a symbol of rebirth, a sentiment that we strongly wish for the Japanese people as they continue to recover from the devastating earthquake of 2011. We also thought that it was appropriate for KotoKoto’s launch in our hope to be an ever changing and exciting website for people to discover new things. The butterfly motif has enjoyed widespread popularity in Japan since the Nara period (710-794). The fern is a symbol of long life and family prosperity because of the numerous spores on its leaves. We especially liked this pattern because the fern represents elegance and hardiness, characteristics that we seek in the skill and craft of artists. The fern motif has been popular in Japan since the Heian period (794-1185) and has also been fashionable in the West since the ‘pteridomania’, or a craze for ferns, struck Victorian Britain in the 19th century. We are now testing colors with Saratetsu and will be starting to print these fabrics very soon! Read all of the previous postings about Saratetsu here. Hagiwara Ichizo of Saratetsu, the last yuzen dye studio of wrapping cloth (or furoshiki) in Tokyo, is an expert at dyeing a variety of natural fabrics, so Studio Kotokoto asked him to print a pattern from their collection of old paper stencils onto Japanese linen. We chose Japanese linen because it becomes more beautiful with time and use. Moreover, this fabric has deep roots in Japanese history. It was among the most popular fabrics used in the country until a century ago but was pushed aside by cheaper imports. It has been making a slow comeback in the past few years. However, linen is also notorious for its resistance to dye transfer, and today’s dyed linens are mostly piece or yarn dyed. Despite these production challenges, Hagiwara-san not only took on the task but said that he could also dye a different color on the back. This is a truly amazing feat and he is probably the only dyer in Japan or elsewhere who can make this happen! The factors that control colors are the mixing of dyes and the duration of steaming to fix the dye. Hagiwara-san tests each color and combination and carefully records the results in a logbook. After the dye is applied, the fabric is steamed to bring out and fix the color. Hagiwara-san gave a demonstration to show how the duration of steaming can change the hues of the same color. When a fabric is dyed on both sides, the color on one side adds to the hue on the other. So Hagiwara-san and his colleagues undertake constant experimentation and testing to achieve the intended effects. Controlling the dye and preventing seepage into the back is a special skill that has taken several generations for Saratetsu to perfect. In the next blog post we will share some of Saratetsu’s collection of old paper stencil patterns and decide which of these styles to apply to our linen. 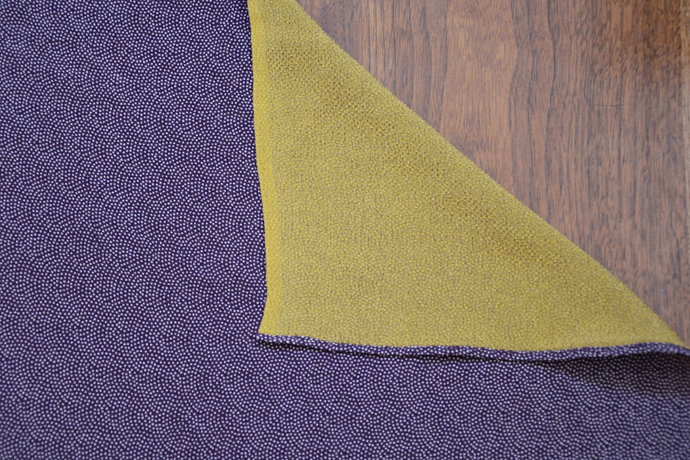 Take a look at this silk fabric that has been dyed into deeply contrasting colors on its two opposing sides. Silk wrapping cloth by Saratetsu Tokyo. This is the work of Saratetsu, the last remaining hand-dyer of wrapping cloth (or furoshiki) in the central 23 wards of Tokyo. Owned and operated by Hagiwara Ichizo, Saratetsu has been dyeing yuzen-style for three generations since 1910. Ai was given a tour of their studio in early May. Yuzen is a method of dyeing fabric by using sticky rice husk resist. Hagiwara-san says that by only using this traditional dye resist is it possible for a thin fabric such as silk to be dyed into a different color on each side. While many dyers in Japan have switched to machines and other more economical methods, Saratetsu has continued to carry on the yuzen tradition by dyeing everything by hand. Yuzen dyeing is extremely labor intensive, involving detailed accuracy and care at each step of the process. Sliding the stencil to continue the pattern. Then going back and repeating this process many, many times! Saratetsu specializes in free hand and stencil yuzen-dyeing, and their attic is full of hand carved paper stencils that were previously used. The patterns of old stencils are beautiful and continue to appeal to our modern eyes. KotoKoto is discussiing with Saratetsu to revive one of these old paper stencils onto fine linen.